Add watermark to a lot of photos at once, fastest speed with simplest step. Do you like to share your home videos with relatives and friends online? Do you record videos to advertise your products via internet? If you share a home video online, to protect video from bad using, adding identity or ownership information like signature is necessary. And if you record a product video, adding a company logo will be very useful. Maybe you also need the: photo watermark software. Your product is great and very helpful. I can use it to do many jobs and for most of them, I can design by myself. You just created an excellent tool! I love your watermark software because it’s powerful and very easy to control. I upload 100 video files every week. The video copyright is very important. This video watermark program helps a lot. Common settings - color, width, opacity, rotate, etc. 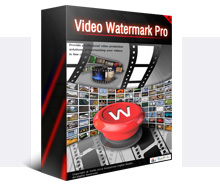 Now, only $34.95 you will get Video Watermark Pro lifetime license for 2 PCs and enjoy free consumer service and free update lifetime.